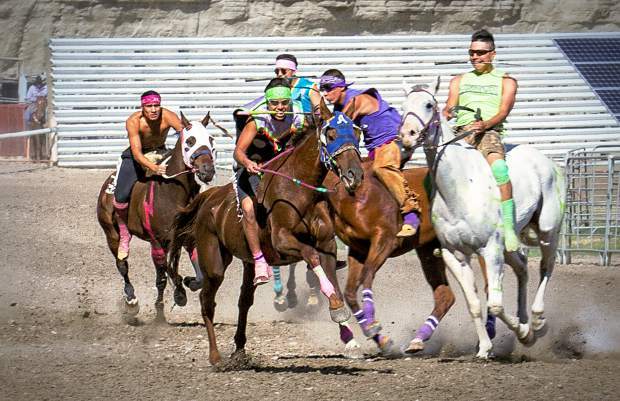 Buffalo, Wyoming: The first sanctioned Indian Relay Races of the season were held in Buffalo, Wyoming this week-end in front of a capacity crowd. Exciting action, great sportsmanship and competition, a beautiful setting, and cool temperatures all set the stage for a successful event. Teams from throughout the northern plains Indian country entered this important opening race in Buffalo for a purse of $50,000 and points earned towards the championships in Billings in September. • Relay 3rd Place-Real Bird Bucking Horse with rider Darrin Charges Strong and owner Richard Real Bird from Garryowen, Montana representing the Crow Nation. • Relay 4th Place-Lakota War Path with rider Tyler Coultier and owner Cubby Ghost Bear representing the Oglala Lakota Sioux nation from Pine Ridge, South Dakota. • Relay 5th Place-Medicine Tail with rider Hamley Real Bird and owner James Real Bird representing the Crow Nation from Garryowen, Montana. • Consolation – Crow Team Warman with rider J’ree Old Bull and team owner Robert He Does It. • Consolation 1 – Plain Feather with rider Dusty Manual and owner Benita Plain Feather representing the Nakota and Crow Nations. • Consolation 2 –Brew Crew Team with rider Hermes Tall representing the Oglala Lakota Sioux Nation. • Charmayne Weed representing the Eastern Shoshone won the Ladies Race amongst a very strong ladies field. In addition to the relay races, the audience was treated to Kids Relay Races, Junior Relays, Warriors and Ladies Races. Teams dressed in full regalia, paint their horses with distinctive team colors and symbols to give spectators 2.5 hours each day of non-stop excitement. Up to date information about the 2016 Relay Race Schedule is available on their Facebook page at this link. Tickets for the 2016 All Nations Indian Relay Championships are already on sale via http://www.letsrelay.com or the MetraPark ticket office at 800-366-8538.